One of our best selling cupcake wrappers for weddings! When you want the cupcakes to be a prominent accent to the table design then wrap them exquisitely in our damask cupcake wraps. Our silver shimmer damask wraps will give a classic and elegant touch while adding volumes of style to the table decor. Our charming wraps stand 2" high with a slightly flared construction and will fit standard size cupcakes. 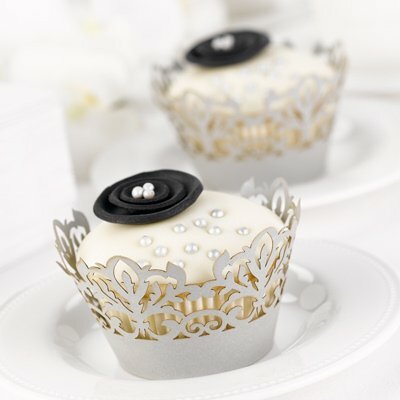 The sweet deliciousness can be viewed by all with the delicate damask die-cut design. The lovely wraps are sold in packages of 25. Cupcakes not included.